It was a fitting tribute to the genius of the left-footed wing necromancer who had not only emerged from nowhere to score two goals as Nigeria won the Africa Cup of Nations in 1994, but also had been instrumental to their enchanting World Cup play in the U.S. a few months later. “Before I came into Tanzania, there were other coaches,” the Nigerian told ESPN. “When I came, nobody expected us to do much because, with all due respect, many of us Africans don’t believe in each other. We feel that only Europeans can do the job. “But I said one thing at my first press conference: That we are not here to make promises to anybody, but I believe that if we work very hard we can qualify; and that is exactly what we did as a team. From the administrators to the players, to the fans and the fans. 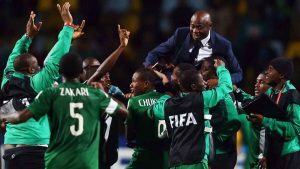 Amuneke’s extraordinary achievement with Tanzania lines him up behind the late great Stephen Keshi as only the second Nigerian to lead a team to qualify for the Africa Cup of Nations.